Get Focused...Stay Focused! - What is the Get Focused...Stay Focused!® Program? 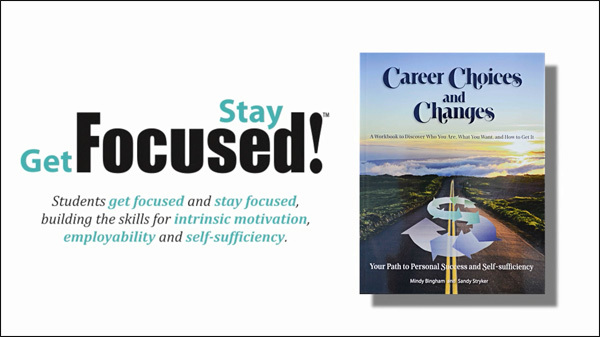 What is the Get Focused...Stay Focused!® Program? from other college and career ready programs? Get Focused...Stay Focused!® (GFSF) supports what research says is best for students. GFSF was designed for ALL students rather than a select few or a special population within a school. In the GFSF program, all incoming freshmen take a freshman transition course in which students develop an online 10-year career and education plan. This semester or year-long comprehensive guidance course is as applicable for the highest functioning students as it is for at-risk students. After the freshman transition course, students continue in the 10th, 11th, and 12th grades updating their 10-year Plans and expanding their career and educational options using the three GFSF Follow Up Modules. The 10-year plan, easily accessible online, is used by all instructors and counselors for advisories and academic coaching. GFSF is specifically designed to promote not only college/post-secondary attendance, but more important, post secondary/college completion leading to employment. Because of the carefully formatted comprehensive guidance coursework (138 hours over four years), students understand and internalize the consequences of dropping out, whether it is high school or college. 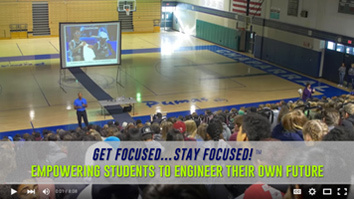 Unlike most college and career ready programs, whose goal ends with the matriculation into college, the GFSF planning process specifically promotes college completion and employability in a carefully chosen career with the skills necessary to be competitive in the workplace of the 21st century. GFSF is a curriculum-based effort, with comprehensive instructional materials for each grade in high school. classroom teachers have the tools to deliver, from the first day of class, consistent, content-rich lessons in a meaningful scope-and-sequence fashion. The curriculum materials address rigorous standards. The freshman transition course not only meets the Common Core State Standards, but also aligns with the Standards for a Freshman Transition Course from the George Washington University's Freshman Transition Initiative. To allow for easy integration into English Language Arts classes in 10th, 11th, and 12th grades, the three Get Focused...Stay Focused!® 16-lesson modules were developed using the English Language Arts Common Core State Standards as the foundation. The GFSF program flips the college decision-making paradigm. As a country we've had it backwards for a long time. Today most students first choose the college they want to attend, with little thought of a major, much less a career. It's little wonder that far too many students wander through the educational maze and do not complete. In reality it is a career path that indicates which major or program of study to tackle, which in turn dictates which college to attend. The GFSF program exposes students to this reality and beginning in the freshman year, provides the foundation to help them tackle this more realistic, multi-stage strategy. This is only possible because of the comprehensive guidance coursework (up to 138 hours of classroom time) designed in a careful scope and sequence fashion that is not only developmentally appropriate but also reinforces the critical and creative thinking skills coveted in today's workforce. Through this in depth planning process students build the intrinsic motivation necessary to succeed. The keystone of the GFSF program is a 10-year career and education plan that is broader than the four-year education plans commonly used by high schools and colleges. Students develop and then upgrade and enhance an online 10-year Plan of their own design. This tool was designed to propel them from high school graduation into and through college or post-secondary training and into employment that leads to economic self-sufficiency and life satisfaction. Why? When they know their career pathway, they enter post-secondary-education ready to declare a major or program of study that matches their individual drives and life goals. In a study of 430,000 incoming California Community College students, students who entered a program of study in their first year were twice as likely to complete a certificate, degree or transfer as students who entered a program after their first year (Moore & Shulock, 2011). Two national studies found similar results (Jenkins and Cho, 2012; Jenkins and Weiss, 2011). Students' online 10-year Plans can be used by all instructors and counselors for advising and academic coaching. A sophisticated, browser-based tool, the online 10-year Plan creates the opportunity for true personalization with each student. The 10-year Plan Summary Page can be quickly reviewed by an instructor or counselor, enabling them to provide laser-focused advice and guidance centered on each student's goals, plans, and dreams. The mobile app provides portability and just-in-time access to the 10-year Plan. In their coursework, students learn that the 10-year Plan is a lifelong process. The new app provides a mobile option to students who create an online 10-year Plan. Students have, on-demand, access to the information that populates their 10-year Plan Summary Page. Using the app, students can share their plans with advisors, mentors, family, and friends at a moment's notice, and they can also update their plans with new information when inspiration strikes. Students develop a long-range Skills-based Education Plan that promotes successful entry into the workforce, rather than the traditional Student Education Plan that merely focuses on graduation from school. A traditional Student Education Plan outlines the courses required to graduate in a student's major or program of study. Unique to the GFSF program, the Skills-based Education Plan helps students create a plan which includes not only skills and knowledge gained in traditional course work but strategies to acquire specialized skills required for their identified career path. In today's workforce, when there are so many experienced workers seeking employment, it is difficult for a recent graduate to be competitive. Employers are looking for individuals who have the specialized job contents skills they require. Except for professional advance degrees, most traditional courses cannot deliver the wide range of information required. Therefore, students must learn how to become self-directed learners and seek out opportunities (internships, mentorships, on the job training, online courses and even the best book on the topic) in order to acquire the knowledge and skills necessary to be competitive. The coursework for GFSF supports the development of the higher-order thinking skills required in the 21st century workforce. Most career exploration programs use online assessments that defer to algorithms rather than adult advocates when advising students. After answering a string of multiple-choice questions, the computer magically maps an education or career path for the student. In contrast, the GFSF program was designed to teach students a decision-making process in which they employ their own brainpower to analyze, synthesize, and evaluate life choices before developing their own strategic plan. The learner can use this in-depth model throughout their life as they navigate our fast-changing workplace and society. The coursework for GFSF supports the development of the non-cognitive skills required for success in the workplace. The non-cognitive skills of self-efficacy, purpose, and hope (all components of self-motivation) are the essence of GFSF course work. The freshman course curriculum takes the students through a semester or year-long road of self-discovery by having them address three important questions: Who Am I? What Do I Want? How Do I Get It? During the course students not only research three careers of their choosing, but they also must research costs of living based on where they would like to live, how much they can expect to earn in their chosen career(s), and the importance of maintaining a good attitude, being able to face roadblocks, and becoming adaptable to change (coping and resilience). Both the freshman course curriculum as well as the follow-up GFSF Modules for 10th, 11th, and 12th grades help students become organized and self-regulated (important intra-personal skills) in the way workbooks and the 10-year Plan are structured. The GFSF program is the �missing link� for career academy and career pathway programs. Most career academy or pathway students are asked to select their path after attending an assembly or a career fair. Is it little wonder that these important programs are plagued by high dropout rates and �pathway hopping� (i.e., lateral movement between pathways)? Without the benefit of a comprehensive guidance course that takes students through the process of determining not only the career they desire but also the lifestyle they envision, too many young people make uninformed choices and lose interest or focus before completing a program of study. The GFSF program was designed to include a viable dual enrollment option. Santa Barbara City College (SBCC) has one of the largest and most well-respected dual enrollment programs in the country. The GFSF program began with a 3-unit Dual Enrollment Freshman Transition (DEFT) course at four high schools in the SBCC attendance drop zone. The 16-lesson Get Focus...Stay Focused!® follow-up modules can equate to one unit of college credit for each module. While the dual enrollment component is optional, it is encouraged, when possible, because of the impact it has on freshman students. When they realize that they can tackle college-level material, students expand their personal vision of what is possible. Designed so schools can launch quickly and efficiently, GFSF has one of the most comprehensive professional development programs available. Eastern Oregon University offers a graduate level certification program for GFSF Program and Curriculum Specialists. This 15 unit coursework prepares specialists who can be embedded in a school district and provide ongoing technical assistance, which research shows is the highest level of support. The GFSF program changes the culture of your school. When students have completed the comprehensive guidance coursework and their online 10-year Career and Skills-based Education Plans, every adult in the high school can personalize their work with each student. Academic instructors can review each student's 10-year Plan so they can recognize student goals�both in class and in one-to-one discussions. Parent-teacher meetings can be even more productive when their child's 10-year Plan is part of the discussion. With training, classroom instructors can support the over-committed guidance staff on each campus and become part of the advisory team. After all, guidance is recognized as critical to student success. Attendance will increase and academic achievement will increase, while suspensions and dropout rates will decrease. Why? Because when students see a path to a satisfying life, they understand the value of education. Students no longer ask, "Why do I need to learn this?"